Medicaid enrollees with ID/DD generally benefit from access to a range of social and educational, employment-related, rehabilitative, and medical services tailored to their particular needs. To help meet these needs, states designed ICFs/IID to provide residential care and a variety of specialized services. In recent years, states have moved to serve the ID/DD population with HCBS, in part due to the Olmstead decision, which mandated that they be served in communities where appropriate. Consequently, people with ID/DD may live and receive services in a community setting or in an ICF/IID. Because many enrollees receiving HCBS live in group homes, and because not all ICFs/IID are large -- some have as few as four beds -- the distinction between ICF/IID and HCBS use is not a sharp one (despite the clean separation between the two types of service implied by some of the analyses below). ICFs/IID were originally conceived as large institutions, but caregivers and policymakers quickly recognized the potential benefits of greater community integration, spawning the growth in the early 1980s of community ICFs/IID with between four and 15 beds (Prouty et al. 2008). The two types of ICFs/IID differ substantially. The number of individuals residing in large public ICFs/IID has decreased steadily over time (from 55,000 total residents in 1997 to 32,000 in 2009). Many states have either closed these facilities completely or downsized them as smaller institutions and community settings have gained favor as more integrated settings in which to deliver care. In still other states, however, state-run ICFs/IID areactive portals to the ID/DD service system, especially for crisis/emergency situations.19 While the populations of large institutions have declined, the number of individuals served by community ICFs/IID has remained more stable over time.20 Although they are of declining interest for new development, these "community" settings are noteworthy for both their stability as institutions and the stability of their resident populations over time. Thus, although all ICFs/IID are technically institutions, the smaller community ICFs/IID represent an intermediate alternative on the continuum of ID/DD care between HCBS and care in larger institutions. Although we discuss ICFs/IID as a single group below, it is important to bear in mind that larger state-run ICFs/IID often look different from the smaller community ICFs/IID and the extent to which one type or another dominates varies extensively across states. These differences likely reflect different approaches to the care of the ID/DD population, including how HCBS is integrated with institutional services.21 Future research would benefit from the availability of data that permit the use of services in large state-run ICFs/IID and smaller community ICFs/IID to be explicitly analyzed and compared. Such data could be used to explore the movement of institutionalized individuals from larger care settings to smaller ones, as well as the variation in the use of services provided by large and smaller ICF/IID across states. 1. How Many Enrollees Had New Spells of ICF/IID Care? Few Medicaid enrollees used ICF/IID services. Of the nearly 12 million enrollees who were either elderly or eligible on the basis of disability between July 1, 2006, and December 31, 2007, only 93,761 had been in an ICF/IID, and only 9 percent (8,430) of those individuals -- representing less than one-tenth of 1 percent of all elderly or disabled enrollees -- had new spells of care. Thus, turnover in ICFs/IID was significantly lower than the turnover rate reported for enrollees in nursing homes (Chapter II). The number of enrollees residing in ICFs/IID was also relatively low compared to the number of enrollees with ID/DD who received HCBS waiver services in the community: in 2006, approximately 410,000 individuals were enrolled in waivers for individuals with ID/DD (MR/DD waivers) in the states analyzed here (Ng and Harrington 2009). SOURCE: Mathematica analysis of 2006-2007 MAX data for 44 states and the District of Columbia with representative FFS nursing home and ICF/IID data (excludes data from Arizona, Indiana, Maine, Minnesota, New Hampshire, and Utah). NOTES: New spells are spells beginning on or after July 1, 2006. Data for Georgia, Rhode Island, and Tennessee were included in the analysis even though total institutional care expenditures as reported by the MAX data and CMS Form 64 differed substantially (a variance across data sources of at least 33% in 2007), as there were no known data anomalies for these states believed to invalidate the MAX-based statistics. Cell sizes of less than 11 are not displayed. Although much emphasis has been placed on re-balancing services for the ID/DD population toward community settings in the wake of the Olmstead decision, concerns have been raised about the lack of institutional capacity in some states for individuals with complex needs (Western Interstate Commission for Higher Education 2009). For example, because no ICF/IID was located in Alaska during the study period, it placed its four enrollees requiring institutional services in three Idaho facilities. 2. Who Used ICF/IID Care? The majority of enrollees with new ICF/IID spells were male and under 65 years old, with a substantial number having multiple spells of care during the study period. Unlike nursing homes, whose residents are more likely to be female and elderly, 60 percent of the 8,430 enrollees with ICF/IID spells were male, and 38 percent were between 21 and 44 years old (Table III.2). Significant percentages of enrollees residing in ICFs/IID were younger than 21 (29 percent) or between 45 and 64 years old (27 percent). NOTE: New spells are spells beginning on or after July 1, 2006. Of all enrollees with new spells of ICF/IID care, 15 percent had more than one new spell within the 18-month period between July 2006 and December 2007, and 12 percent had spells in both ICFs/IID and nursing homes (discussed in greater detail below). Older women were much more prevalent among those who used both ICFs/IID and nursing homes: slightly less than half of all enrollees who received both types of institutional care were female, and 17 percent were over 65 years old, compared with only 6 percent for enrollees with only ICF/IID spells. It is possible that some ICF/IID residents were moved to nursing homes as they grew older and required more complex and continual medical care, but the vast majority of enrollees with stays in both types of institution (83 percent) were younger than 65. NOTE: New spells are spells beginning on or after July 1, 2006. MAX data reported no new ICF/IID spells in Oregon. Methods used to determine which states utilized the 300% rule or had a medically needy program in 2007 are described in Appendix B. State had a medically needy program in 2007. State utilized the 300% rule in 2007. Section 209(b) state. Because Section 209(b) states are required to allow persons receiving SSI to deduct incurred medical expenses from income to determine financial eligibility, some people in 209(b) states may be coded as medically needy even if the state had no medically needy program. 3. How Did Enrollees Residing in ICFs/IID Become Eligible for Medicaid? More enrollees using ICF/IID services qualified for Medicaid benefits through cash assistance-related criteria than through any other pathway, with the vast majority already enrolled in Medicaid prior to admission. Across all 45 states, nearly half of all enrollees in ICFs/IID qualified for full-benefits via the cash assistance pathway in 2007, followed by "other" criteria (33 percent) and medically needy programs (15 percent) (Table III.3).24 In roughly half of states analyzed (23 out of 45), the majority of ICF/IID residents with new spells qualified for Medicaid at the start of their spell due to their low-incomes -- that is, they qualified under cash assistance-related criteria. Moreover, in all states except Illinois cash assistance-related criteria represented either the most common or second most common pathway to Medicaid eligibility. Finally, cash assistance was the most common pathway to eligibility in the two states with the largest number of new spells: California and Texas. "Other" criteria were the most common pathway to eligibility in 15 states -- one-third of which are 209(b) states -- while medically needy programs were the most common pathway in four states. As with enrollees in nursing homes, poverty-related expansions were a common pathway to eligibility in Hawaii, Massachusetts, and North Carolina. In contrast to enrollees in nursing homes, most enrollees living in an ICF/IID were enrolled in Medicaid prior to their first spell of institutional care, with only 11 percent not enrolled two months prior to admission (Table III.4). Among those qualifying for benefits two months prior to their ICF/IID stay, most qualified either via cash assistance (48 percent) or "other" (24 percent). Cash assistance was either the most common or second most common pathway to eligibility in all states except Illinois. Thus, recipients of Medicaid-financed ICF/IID services generally had low-incomes and were not spending down available assets as many nursing home residents do. As with enrollees in nursing homes, retroactive eligibility for Medicaid benefits at the time of admission to the ICF/IID likely accounts for some of the observed enrollment in Medicaid two months prior to admission. SOURCE: Mathematica analysis of 2006-2007 MAX data for 44 states and the District of Columbia with representative FFS nursing home and ICF/IID data (excludes data from Alaska, Arizona, Indiana, Maine, Minnesota, New Hampshire, and Utah). NOTES: New spells are spells beginning on or after July 1, 2006. MAX data reported no new ICF/IID spells in Oregon. Methods used to determine which states utilized the 300% rule or had a medically needy program in 2007 are described in Appendix B.
ICF/IID residents who were enrolled in Medicaid prior to admission generally continued to qualify for benefits according to the same eligibility criteria following admission, with 87-93 percent of those who qualified via the "other," cash assistance, and medically needy pathways remaining in the same MAS group (Table III.5). As with nursing homes, the percentage remaining in the poverty-related group (46 percent) was lower, with most of those enrollees qualifying for benefits under "other" criteria following admission. Among those residents who were not enrolled in Medicaid two months prior to admission, approximately half qualified for Medicaid via the "other" pathway, with the remainder qualifying via the cash assistance (29 percent) and medically needy (19 percent) pathways. NOTES: New spells are spells beginning on or after July 1, 2006. MAX data reported no new ICF/IID spells in Oregon. 1. How Long Did Enrollees Live in ICFs/IID? Most enrollees living in ICFs/IID were long-term residents, with more than seven out of ten individuals with new spells staying for more than one year (Figure III.1). Some of these individuals might have required the level of services that can only be provided in an institutional setting. Others might have benefited from transitioning to the community, but their family members or guardians might have lacked information about community-based options or resources for facilitating a transition. SOURCE: Mathematica analysis of 2006-2007 MAX data for 44 states and the District of Columbia with representative FFS ICF/IID data (excludes data from Arizona, Indiana, Maine, Minnesota, New Hampshire, and Utah). NOTES: New spells in this figure are spells beginning between July 1, 2006, and December 31, 2006, inclusive; spells are censored at December 31, 2007. 2,908 enrollees had new ICF/IID spells beginning between July and December 2006. The median length of first new spells was 425 days for ICFs/IID. 2. Did Enrollees with ICF/IID Stays Also Have Nursing Home Stays? The closure of larger ICFs/IID in recent years, combined with the greater emphasis on HCBS for the ID/DD population, raises the question of where enrollees who had previously used ICF/IID services were placed: in other ICFs/IID, in nursing homes, or in the community? A substantial minority of enrollees in ICFs/IID were admitted to multiple types of institutions, with 994 of the 8,430 (12 percent) with ICF/IID admissions also receiving nursing home care during the 18-month study period (Table III.6). These 994 individuals represented a tiny share (0.1 percent) of all enrollees in nursing homes. Thus, while it is unusual for a nursing home resident to require ICF/IID care -- which requires a diagnosis indicating a need for such care -- it is not uncommon for ICF/IID residents to require nursing home services at some point. NOTE: New spells are spells beginning on or after July 1, 2006. Spells are censored at December 31, 2007. Most ICF/IID residents with nursing home spells lived in the nursing home prior to being admitted to the ICF/IID. Of the 994 enrollees in ICFs/IID who had multiple spells of institutional care, 872 moved from nursing homes to ICFs/IID, while 122 moved from ICFs/IID to nursing homes. Many of these enrollees appear to have been transferred directly: 59 percent of enrollees moving from a nursing home to an ICF/IID did so within one day, and similarly for 47 percent of enrollees moving from ICFs/IID to nursing homes. The gap between spells was less than 60 days for the vast majority of enrollees with spells of both types of institutional care. Given that ICF/IID residents who also have spells of nursing home care tend to be older (Table III.2), it is possible that ICF/IID-to-nursing home transitions occurred for enrollees with ID/DD who required more frequent or intensive nursing care as they grew older. Although it is unclear why a much larger number of enrollees transitioned in the opposite direction, some might have been admitted to nursing homes either while waiting for an ICF/IID bed to become available or to receive post-acute care within our observation period. Several states -- including California, Florida, Illinois, Mississippi, Nebraska, Oklahoma, South Carolina, and Virginia -- had especially high percentages of nursing home spells following ICF/IID spells within two months.28 Among these states, there was no net change in the number of ICF/IID facilities from 2006 to 2007, although California and Illinois both closed larger facilities during this time. During the same period, Mississippi and South Carolina both closed smaller ICFs/IID, and Oklahoma actually added ICFs/IID. Consequently, it is possible that the closure of ICFs/IID in some states partially explained the use of nursing facilities by persons with ID/DD. It is also possible that downsizing among ICFs/IID that continued to operate further contributed to transitions, particularly of frail or elderly enrollees, from ICFs/IID to nursing homes. 3. Did Enrollees Receiving ICF/IID Care Also Use HCBS? SOURCE: Mathematica analysis of 2006-2007 MAX data for 37 states and the District of Columbia with representative FFS nursing home and ICF/IID data and valid HCBS data (excludes data from Arizona, Indiana, Maine, Massachusetts, Michigan, Minnesota, Montana, New Hampshire, Oregon, Pennsylvania, Rhode Island, Texas, and Utah). NOTES: New spells are spells beginning on or after July 1, 2006. HCBS includes 1915(c) waiver services, personal care services, residential care services, home health, adult day services, and private duty nursing services. Spells are censored at December 31, 2007. New spells beginning in 2007 preceded by HCBS use in 2006 refers to all spells beginning and ending at any time in 2007 (including spells censored as of December 31, 2007) that were associated with an enrollee who used HCBS at any time in 2006; the percentage is taken with respect to all first new spells beginning and ending (possibly censored) in 2007. The percentage of first new spells beginning in 2007 and ending on or before June 30, 2007, preceded by HCBS use in 2006 and the percentage of first new spells ending in 2006 followed by HCBS use in 2007 are defined analogously. State-level detail is provided in Appendix Table D.6. 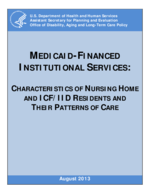 Thus, despite the higher percentage of long-term stays in ICFs/IID, as compared with nursing homes (Figure II.1 and Figure III.1), substantially higher percentages of ICF/IID residents used HCBS before or following their stays (Table II.7 and Table III.7). It was common for a person with ID/DD in the study sample to use both HCBS and ICF/IID services, rather than only ICF/IID services. It is unknown whether this reflects: (1) changing levels of need for persons with ID/DD -- whereby the same individual uses either HCBS or ICF/IID services depending on his or her needs at a point in time; (2) a trial-and-error approach to identifying the most appropriate care setting for the individual; (3) ICF/IID closings; or (4) ICFs/IID -- specifically state institutions -- serving as crisis/emergency placement sites for individuals already being served either via HCBS or in another ICF/IID, or for people entering the Medicaid system in a crisis/emergency circumstance who are awaiting an alternative placement as soon as such a placement can be arranged. The aggregate statistics on HCBS use before or after stays mask substantial variation across states. Considering shorter ICF/IID spells that began and ended during the first half of 2007,all had been preceded by HCBS use in 2006 in six states, whereas none of these spells was preceded by HCBS use in 12 other states.30 Similarly, 100 percent of shorter spells beginning and ending in the latter half of 2006 were followed by HCBS use in 2007 in five states, whereas no such spells were followed by HCBS use in another 12 states. Some HCBS use following ICF/IID stays was likely tied to the closure of a facility. For example, Iowa and Wisconsin both closed at least one-fifth of their ICFs/IID between 2006 and 2007. In these states, rates of 2007 HCBS use following shorter spells in the second half of 2006 were 100 percent, and 89 percent, respectively. However, other states that expanded their ICF/IID capacity during this period, such as Kansas and Kentucky, also had high rates of HCBS use following institutional stays. To understand how policy may be related to ICF/IID use, we assessed the associations between the length of enrollees' ICF/IID stays and policy-related measures. Although these associations may be informative to policymakers seeking to improve ICF/IID services and LTSS more generally for the ID/DD population, it is not possible to determine causal relationships from the data presented here. NOTES: The relationship between the two variables was not statistically significant. SOURCE: MAX, 2006-2007; Lakin et al. (2008); Prouty et al. (2007). Because only a portion of elderly and people with disabilities who require LTC are part of the ID/DD population, we also examined the percentage of Medicaid LTC expenditures for enrollees with ID/DD only that were allocated to HCBS and continued to find no meaningful association with length-of-stay. Assessing the relationship between policy-related variables and other lengths of stay (for example, the percentage of stays lasting more than one year)32 yielded similar results. Given the small population of ICF/IID users, most of whom are young or middle-aged adults who live in these facilities for very long periods of time,33 these results are not entirely surprising. To the extent that policy affects how individuals with an ICF/IID level of need receive their care, it is likely through the diversion of would-be residents to community-based services or smaller group homes. Enrollees residing in ICFs/IID were generally younger adults who remained in residence for a year or longer. Among those who had shorter stays, it is likely that some of these resulted from either: (1) residents being transitioned to the community upon the closure of their facility; or (2) individuals entering the Medicaid system in certain states who are initially placed in state institutions (or other settings that receive people entering the residential service system) on a short-term basis while waiting for a placement in a more appropriate care setting to be arranged. The vast majority (89 percent) qualified for Medicaid even before they were admitted to the ICF/IID and those who qualified in advance generally retained the same MAS upon admission. This is not surprising since their disabilities are generally lifelong and often limit their ability to earn income. More than 40 percent of enrollees living in ICFs/IID used HCBS before their ICF/IID stay, suggesting (as with nursing homes) that it is not uncommon for an individual to use both communityand institutional services rather than solely ICF/IID services. Although few enrollees had both ICF/IID and nursing home stays during the study period, most of those individuals moved from nursing homes to ICF/IIDs, rather than the other way around; these enrollees might have used nursing homes prior to their ICF/IID admission either for post-acute care or while waiting for an ICF/IID bed to become available. There was little meaningful relationship between lengths of ICF/IID spells and state policy variables, although the percentage of stays lasting three months or less was lower in states that closed facilities during the study period.